Seems to me that Microsoft has deprecated the System.Web.Mail, & replaced it with the System.Net.Mail. When I try to send an email using the System.Web.Mail it gives the message obsolete with a warning. Below is the code sample for sending simple SMTP emails with .NET 2.0. //We can use the constructor as well; e.g. Google’s new RSS Feed reader. It gives you the complete power of ajax. Try it here http://www.google.com/reader/lens/ . Socket is a communication mechanism where we use to connect client and the server. Basically the Server will listen to the client connections on specific port number. A client can connect to the Server by using the relevant hostname and the port number. Upon the successful client connection server will gets a new socket bound to a different port. It needs the original socket for listen to other client connections while communicating with the connected client. Below is the simple client /server example done using the .Net 2.0. Review the code & you will find it interesting. (I made it very simple to make you understand) You can modify the code to meet your needs. //Listing to the client connections. This is a simple console application. You can create two console application one for the server & one for the client. Run the server first then client app. If you want you can create nice windows applications using this two simple classes to communicate over network. 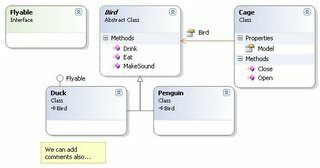 One of the loving features of mine in VS 2005 is class diagrams. The ability to draw class diagrams and the same time it will generate the code for us and vice-versa. 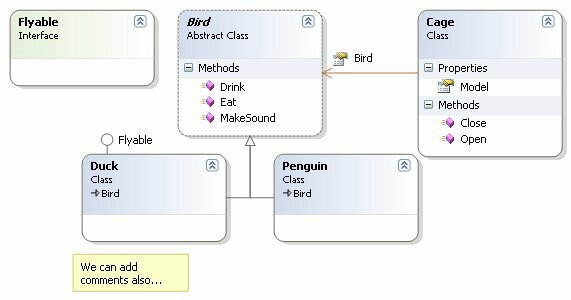 Once you done the development you can simply generate the class diagram by right clicking on the Project > View Class Diagram. If you want to export the diagram as an image, right click on the diagram and select Export Diagram as Image. Below is the sample diagram I created using VS 2005 .